Are your boys fascinated by Steampunk? The Steampunk ABC book is a fun collection of neat gadgets steampunked out. We have been enjoying a few steampunk books and some awesome steampunk inspired LEGO pieces (see my LEGO Inspirations Pinterest Board for examples.) I think it is the decorative nature of the pieces as well as the wonderful creativity and inventive nature of steampunk that drew us in. 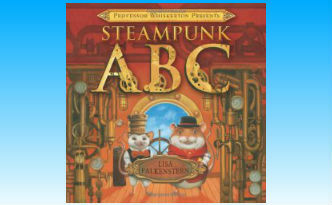 Steampunk ABC features two mice, one named Professor Whiskerton and the other Percy. I love Percy’s hat! They are inventors setting out to build something delightful and useful. As the book progresses you find Professor Whiskerton working with the items named in each letter section and Percy, well, having a bit of difficulty or being silly. I like the word choices here: A is for anvil, P is for periscope, S is for–you guessed it–steam. You can ask your boy what he thinks they are making and other questions such as what do we own that uses gears?, where would you find a periscope? and so forth. There is quite a bit to talk about in this book. Plus, I suggest you get out a few things and let your boy explore the insides by taking things apart and finding some interesting pieces for himself. What will he create with the pieces? It doesn’t have to be something that actually works–let him allow his imagination to flow. The illustrations in the book are extremely detailed and enjoyable. Each letter is made out of the item depicted. For example, the L is made out of a level and the M is made out of monkey wrenches–neat! I won’t ruin the story by telling you what these two mice are up to but let me say it ends in true Steampunk fashion. You might also enjoy: Bembo’s Zoo (you have to see the website–really awesome) and Alphabeasties plus other great books for boys and Alphabet Books for Older Readers. Thanks for stopping by. Feel free to use the contact form or leave a comment below–I would love to hear from you.